Sliding + Frameless. Frameless shower doors offer a sleek, elegant look, but until recently didn't slide. 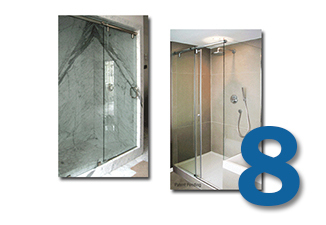 We now offer Hydroslide hardware so you can enjoy the beauty of frameless design with the functionality of a sliding shower door. We also provide the glass and wrap everything meticulously for a safe and successful shipment. Organization is always IN. Kitchens that are beautiful AND functional make homeowners happy long after they are installed. We work with Rev-A-Shelf to bring incredible functionality to new and existing kitchens. Rev-A-Shelf is always coming up with great ideas like a cut-to-size vinyl peg board insert for your drawers with accessories that fit easily for a variety of organizational options -- tidying lids, pots, canisters and more. 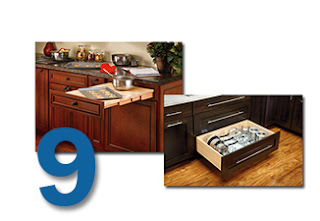 Another great product -- especially for smaller kitchens -- is the roll out counter, pictured left. Because, sometimes you just need more counter space!